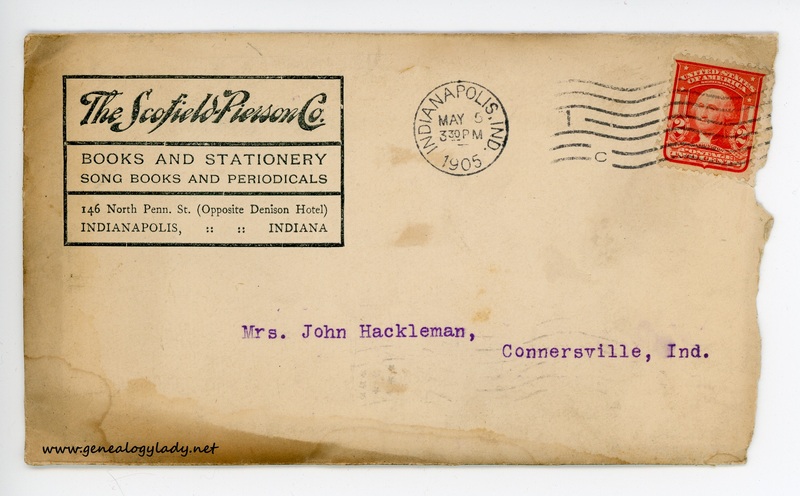 Address: Mrs. J. H. Hackleman, Fayette St., Connersville, Ind. 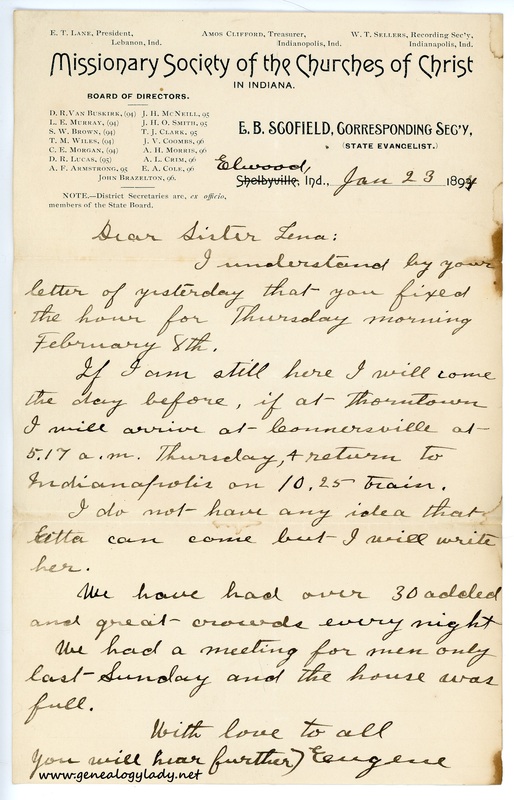 This entry was posted in Genealogy, Lena's Postcards and tagged Connersville, Etta (West) Scofield, Eugene B. Scofield, Fayette County, genealogy, Indiana, Lafayette, Lena (Scofield) Hackleman, postcard on February 20, 2018 by Deborah Sweeney. I am here holding a series of meetings. Commenced Saturday evening under very unfavorable circumstances there being very few in attendance. Last night, however, the house was full. I am using a new fangled pen, and as you see, with varied effect. Am quite well, as was Ettie Saturday when I saw her last. Desiring to try the metal of a horse I wished to buy I loaded Ettie into a bugy and drove to Summit on Saturday afternoon. Drove six miles, somewhat hilly, in 45 minutes. Drove back after half an hour in same time. Unhitched the horse—ran two squares carried two doz. cans of fruit=a doz. each trip down seller—also a box of onions—packed my valirse—hurried four squares to depot—saw the train moving out but succeeded in stoping it, and was on the cars all in 25 minutes from the time I drove up to Saffles stable. We expect to move next week. We will pack up and ship our goods on Friday and will go down and have the floors scrubed Saturday—haul in our goods and on Monday Ettie will go down, and in a few day we will be all right. I was called to Greenfield and preached Thursday & Friday & Sat. evenings to large audiences. Had a very pleasant time. Saw their gass wells and sat by my first gas fires. I will not try to tell of the conveniences of natural gas as you have heard so much about it. There is gas now burning in the grate behind me as write in the pleasant home of Bro. J.P. Shoemaker. Enclosed find clipping that will arouse old memories. Place in one of my books after you read it. With kisses for little ones and love to all I am your Brother E.B. 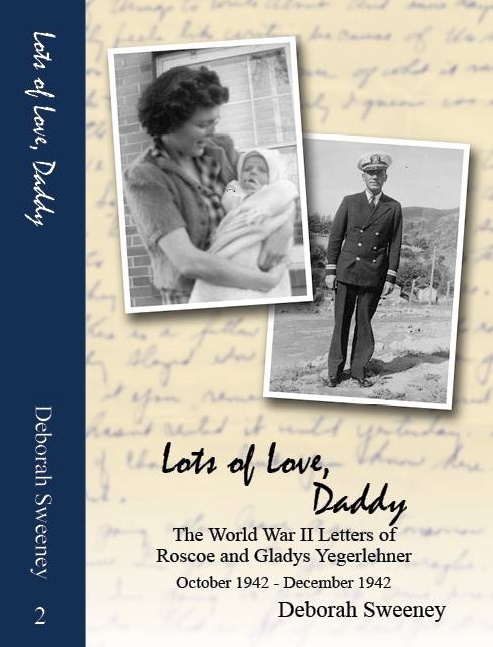 This entry was posted in Fayette Friday, Genealogy and tagged Christian Church, Connersville, Etta (West) Scofield, Eugene B. Scofield, Fayette County, Indiana, J.P. Shoemaker, Lena (Scofield) Hackleman, letters, Middletown on February 16, 2018 by Deborah Sweeney. Ettie wanted me to write to you Friday last but as I was very busy I failed to do so, and as I have been from home every since I had to put it off until now. I am on my way home from the Hannagan and am waiting for my train. I write this expressly to urge you to come up and visit us as soon as you can arrange to do so. Ettie would like for you to come the last of this week and remain as long [as] you can. I am at home most of the time and can be with you. Can you not spend several days with us before harvest? Love to all—Drop us a card that you will come. Write soon. 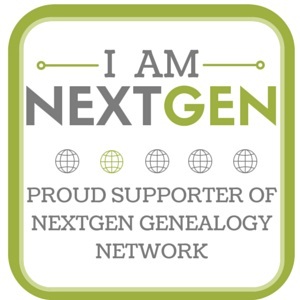 This entry was posted in Genealogy and tagged 1886, Connersville, Etta (West) Scofield, Eugene B. Scofield, Fayette County, Indiana, Lena (Scofield) Hackleman, Rush County, Sexton on January 26, 2018 by Deborah Sweeney. You ask why I do not write, and my humble reply is I have no excuse. However, I have been from home so much, and my time has been so occupied when at home with my professional labors that I have little time or disposition to write. Last Friday Ettie and I went to Summit where she will remain for some ten days during my absence at Cadiz for a week or so. 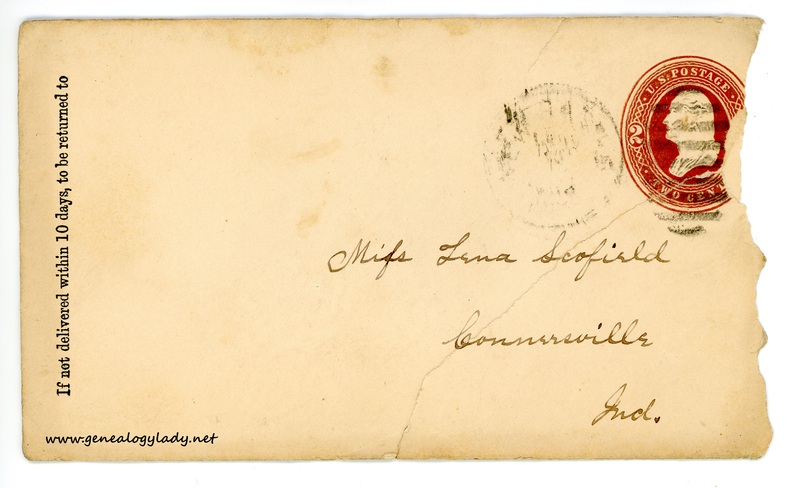 I returned from S. next day, and spent Sunday at Millville, and have just got home. Am all alone. I go to Cadiz this 2 p.m.
much elated at the idea. Says it will be. Now my dear sister you have about all the news I can impart. Dr. Booe, our good neighbor and brother, has been sick, but is some better. A Mrs. Kinsey, who was visiting her daughter, on the opposite side of the street from us died this 7 a.m. two hours ago. Bro. D. K. Van Buskirk is to be here next week and the week after. The death rate is rather high this Spring in this county. Thanks for C.[Connersville] papers, they are always welcome. Give my love to all, and accept much yourself. Would be glad to have you come up as soon as you can make it convenient. 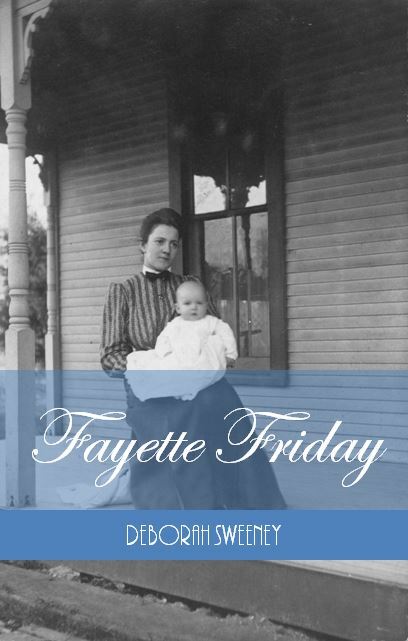 This entry was posted in Fayette Friday, Genealogy and tagged 1886, Christian Church, Connersville, Etta (West) Scofield, Eugene B. Scofield, Fayette County, genealogy, Indiana, Lena (Scofield) Hackleman, Newcastle, wiles on January 19, 2018 by Deborah Sweeney.